On June 27th Ancient Digger reported that The Royal Ontario Museum (ROM) will host the Canadian premiere of The Warrior Emperor and China’s Terracotta Army from June 26, 2010. There has now been a change to the venue. UPDATE: Chinese officials' enforcement of government policy is limiting the time the terracotta warriors can travel out of the country to one year. 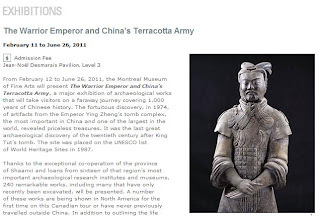 Therefore, The Montreal Museum of Fine Arts (MMFA) will be the FINAL stop for The Warrior Emperor as tour dates that followed (at the Glenbow Museum in Calgary and the Royal BC Museum in Victoria BC) were cancelled in late September. On view from February 12 to June 26, 2011 at the MMFA, The Warrior Emperor and China’s Terracotta Army features the largest collection of artifacts ever displayed in North America related to Qin Shihuangdi, the First Emperor of a unified China. Nearly 1/3 of the 240 remarkable objects including funerary figurines; paintings and sculptures; architectural elements; arms and armor; ornaments in jade and gold, and earthenware objects excavated from the largest burial complex in China (the greatest archeological site in the 20th century since King Tut’s tomb) have never been before on public display internationally. The Warrior Emperor and China’s Terracotta Army showcases one of the most significant archaeological finds in history: the 1974 discovery, in Shaanxi province in north-central China, of thousands of life-sized terracotta sculptures of Chinese warriors. These extraordinary figures, along with countless treasures yet to be uncovered in the elaborate underground tomb complex of China’s First Emperor, were created 2,200 years ago, during the Qin dynasty.